49ers Santa Clara: Why didn’t San Francisco try harder to keep its football team from moving out? The 49ers are moving to Santa Clara. Why didn’t the team’s longtime home try harder to keep them? 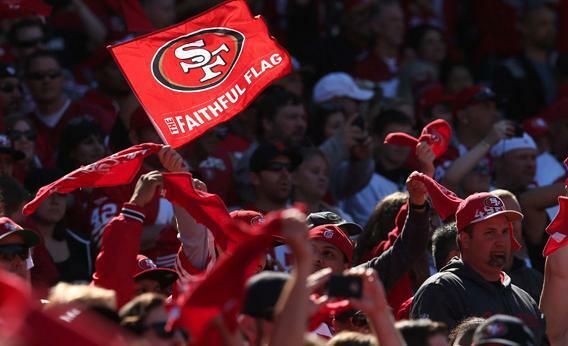 San Francisco fans of the 49ers will soon have a reason not to cheer—the team is moving 40 miles south. Regardless of which team wins the Super Bowl, the 49ers’ San Francisco-dwelling fans will soon be losers. That’s because the franchise is leaving the city it has called home since 1946. The team’s first kickoff in a new stadium 40 miles away in Santa Clara—a sunny city wedged between San Jose and Sunnyvale that’s home to tech companies’ headquarters and 120,000 residents—is expected in 2014. Construction is well underway. Why are the 49ers leaving town? The city of San Francisco—perhaps to its credit—didn’t offer a sweetheart land deal or a financial lure enticing enough to hold on to its football team. But former Mayor Gavin Newsom deserves a good share of the blame. For years, he pressured the 49ers to build a new stadium inside a deserted and radioactively polluted naval shipyard. The team resented the proposal, and the city didn’t make any serious offers that didn’t involve relocating to a Superfund site. In the meantime, Newsom did propose a sweetheart deal to lure a more esoteric event to San Francisco. As the 49ers get set to leave town, the America’s Cup’s 72-foot catamarans will set sail in San Francisco Bay later this year. You can’t fault the 49ers for wanting out of the team’s current home. Candlestick Park is one of the NFL’s most outdated stadiums—little more than a wind-whipped concrete bowl at the city’s southern outskirts. It is flanked by down-on-their-luck neighborhoods, and there is virtually nowhere nearby to stop for a meal or a drink after a game. Its barren Thunderdome aesthetic begets thuggish behavior and frequent brawls in the stands, bathrooms, and parking lot. The South Bay’s adoration of a team that is losing fans in San Francisco also played a large part in the 49ers’ decision. But the roots of the team’s southern migration can be traced back more than 15 years. In 1997, San Francisco voters still giddy from recent Super Bowl victories approved a $100 million bond to help the team build a stadium and shopping mall at the current Candlestick Point location. But that same year, 49ers owner Edward DeBartolo Jr. stepped down from his post amid a federal investigation into bribery allegations related to a riverboat gambling license. He would eventually plead guilty to a felony and shed his financial stake in the team. Control of the franchise shifted to DeBartolo’s sister and brother-in-law. The efforts to rebuild at Candlestick Point collapsed. The team’s new bosses began looking around at alternative stadium sites, including land just south of San Francisco in the tiny city of Brisbane. In 2006, Santa Clara became the team’s favored new home. Gavin Newsom, by this time San Francisco’s mayor, responded quickly to the announcement, pressuring the team to relocate instead to the shipyard. In 2008, San Francisco voters repealed the $100 million bond measure from 1997 and approved a shipyard redevelopment plan anchored by a 49ers stadium. The stadium was to be a fantastical anchor in homebuilder Lennar Corp.’s plans to refashion hundreds of acres of weedy wasteland into a thriving metropolis for well-to-do residents. Lennar offered the team virtually free use of shipyard land and $100 million, a liberal chunk of its anticipated redevelopment profits, to help meet stadium construction costs. Rep. Nancy Pelosi helped secure hundreds of millions of dollars from the federal government for environmental work at the shipyard, which was used in part to clean up a neat rectangle of land where the stadium would be built. Surrounding shipyard soil remains heavily polluted. But never once did the 49ers say they wanted to move to the shipyard, which is one of the nation’s most polluted places. An underground landfill at the site filled with petroleum and other toxic chemicals burned for more than a month in 2000, releasing an acrid cloud through the soil. By 2010, even as Newsom offered the 49ers a polluted shipyard, he proposed giving away an estimated $128 million worth of prime waterfront property rights and other public benefits to Oracle Corp. co-founder and America’s Cup holder Larry Ellison for the right to host the America’s Cup regatta. That was despite there being few other serious bidders for the event. Warm-up racing began in 2012 and the America’s Cup will be raced in San Francisco Bay later this year under a less generous deal approved by city lawmakers. In 2009, when I was working as a reporter at the San Francisco Examiner, I interviewed Jed York, Edward DeBartolo Jr.’s nephew, about the plans to move to Santa Clara. This was shortly after the 28-year-old had been appointed president of the 49ers. At that time, many San Franciscans wrongly considered the proposed shift south to be little more than a bluff aimed at securing a richer deal from San Francisco. Newsom’s administration was perpetuating that myth, asserting that a 49ers stadium would yet be built at the shipyard. The 49ers groused for years that San Francisco failed to properly maintain Candlestick Park, which it leases from the city’s parks department. A lawsuit was threatened. The maintenance woes climaxed spectacularly with what Lee described as “a national embarrassment” when the lights went out twice during a Monday Night Football game last season. Aging electrical infrastructure, some of it owned and maintained by San Francisco, failed, causing the outages and delaying a national telecast. “There were lots of maintenance issues at The Stick that made it difficult to discuss other matters with a clean slate,” Avalos says. San Francisco ultimately did not offer the terms or land needed to keep the team. That could be viewed as a good thing: Games register barely a blip in the city’s economy, save for game-day jobs for the surrounding hardscrabble communities. The city makes a few million dollars every year leasing the outdated stadium to the team and taking in some taxes. But it could expect to rake in far more annually in taxes if the waterfront land upon which the haggard stadium sits is turned into a planned neighborhood of stores and exclusive homes. Meanwhile, the 49ers already train in Santa Clara and the team’s corporate offices are there. Santa Clara voters approved a $114 million publicly funded package to help build the $1.2 billion stadium. The site is close to freeways and, unlike Candlestick Park, is easily accessible by public transit. But losing the 49ers is nonetheless a bitter pill for the city’s football fans, especially now that the team has pulled itself out of a decade in the doldrums. The team’s departure is just one of many signs that in San Francisco, the times they are a-changin’. Blacks are evacuating the city. Artists and working class families who can no longer afford the rents are resettling eastward in Oakland and beyond. Entire apartment buildings have been turned into dorms for rich kids studying at the Academy of Art University, while city planners have refused to enforce zoning rules that could have saved the rent-controlled homes. Homeless people, hippies, junkies, and smalltime pot dealers are being arrested and chased out of town by cops at the behest of billionaire bankers and dainty dot-commers. The San Francisco Giants left Candlestick in 2000 for a new stadium, built by the team’s owners at an attractive site leased from the city’s port near downtown. And Mayor Lee is coaxing the Golden State Warriors to move west from Oakland by offering a lease of prime piers near the ballpark for a basketball arena. But the city never offered up any appealing sites for the 49ers. In private talks, city officials left a rebuild at the Candlestick Point location on the table, and the site in nearby Brisbane continued to be discussed. But when it came to a new location for a stadium, the Hunters Point Naval Shipyard was the only site that the city offered. Take it or leave it was Newsom’s ultimatum. “There was not a lot of cooperation,” said planning commissioner Antonini. He said the franchise must share some of the blame for the bad will that mushroomed between team and city officials. But he criticized Newsom’s administration for not working with the 49ers to come up with a more appealing alternative to the shipyard. “People weren’t foresighted enough to work with them,” he said. Take it or leave it? The 49ers decided to leave it. Soon, Super Bowl victory or not, they’ll be gone.